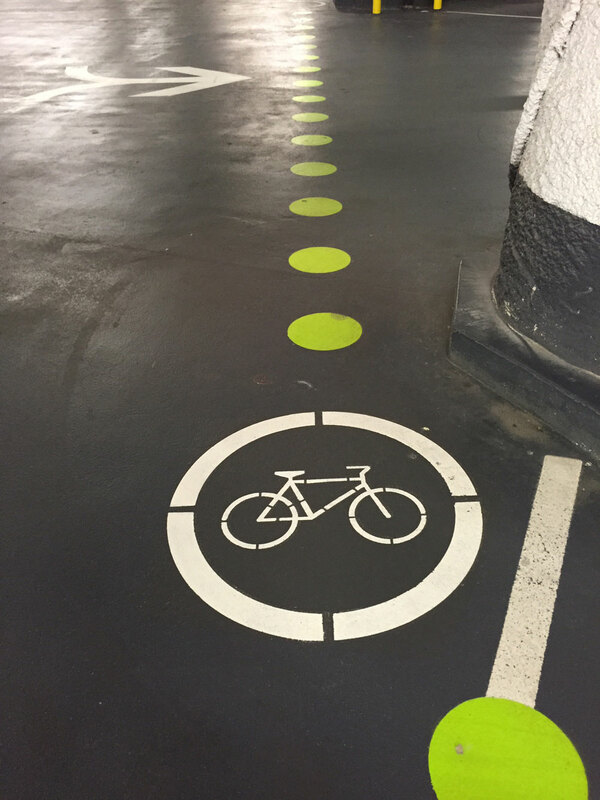 Does your business require special markings for your parking lot or parking garage? Our Edmonton location can provide custom stenciling services for any design you may require. Our custom stenciling services are a great opportunity to utilize your business’ branding. Stenciling is a great way to make your parking lot, garage or building your own and give it the look and feel you want to convey with your brand. Our custom stenciling enables our clients to incorporate their logo or any cool design of their choosing to their parking lot or property. If you have a great idea to make your parking lot stand out or come to life, we can make it happen. In addition to property customization, we are also fully equipped to implement any type of unique markings you may need. If you have special parking stalls, lanes, or different sections of your property that need to be labeled, we can handle it. We can do any kind of custom stenciling you need to make your property look great and function properly. Why should you choose EverLine Coatings and Services for your custom stenciling needs? When you choose EverLine, you get the EverLine advantage. At EverLine, we have the most experienced custom stencil crews in the Edmonton area. Our custom stencil crews have painted a variety of design requests and have seen it all. No matter the size, intricacy of the design, or surface, our custom stencil crews will always deliver a quality end result. In addition to our unmatched experience and services, we also only use the highest quality paint and other related supplies. We make sure that your design will look great and last as long as possible. At EverLine Coatings and Services, we understand just how detailed the nature of custom stenciling jobs are. We have hired and trained the best crews in Edmonton to ensure we are capable of delivering the best results every time. We wouldn’t feel comfortable sending a crew to handle your custom stenciling project that wasn’t prepared to provide the best quality services possible. That being said, we only use crews that have been trained to deliver the highest quality end result every time. We take the quality of our work the integrity of your design very seriously. If you are going to be receiving our custom stenciling services in the near future, please ensure you follow these steps to prepare the surface for stenciling. Firstly, please ensure all vehicles and obstacles that could interfere with the stenciling and painting process from the area. Also, please prepare the surface to be painted by cleaning it and removing any debris. This will ensure that our crews are able to work efficiently, effectively and timely manner to provide a quality end result.